Visiting the Barbary Coast, the red light district of old San Francisco, your chances of getting shot or stabbed increased every hour, and with every laudanum riddled drink. Thugs, pimps, gamblers, gangsters, and hoodlums were so pervasive that only Frisco’s most feared and lethal cops patrolled the streets, armed to the teeth. One especially fun trick was to leave a seat at a crowded bar unoccupied, complete with a full drink and a nice lady next to it. But wait! Before you know it you’ve been clubbed unconscious by Diamond Lil wielding a 2x4 and you've fallen through a trapdoor under the bar stool. Sometimes conveniently landing right into the dingy docked under the bar. The next morning out in the harbor the newly recruited deck hands would find themselves on unfamiliar ships. Forced to work, they were taken on what was known then as a ‘Shanghai Voyage,’ this was later shortened to just being Shanghaied. To go from China to the West Coast of America, one would practically have to sail around the world. A dangerous journey, that. Scenarios like this weren’t just some wild bar tale; they were part of a racket run by over 20 gangs as their main enterprise. Crimps the masters of the shanghai, were so successful that they could in turn open their own boarding house, bars and brothel. Here we have a drawing by Captain Jack Howard the famous Barbary tattooist’s. 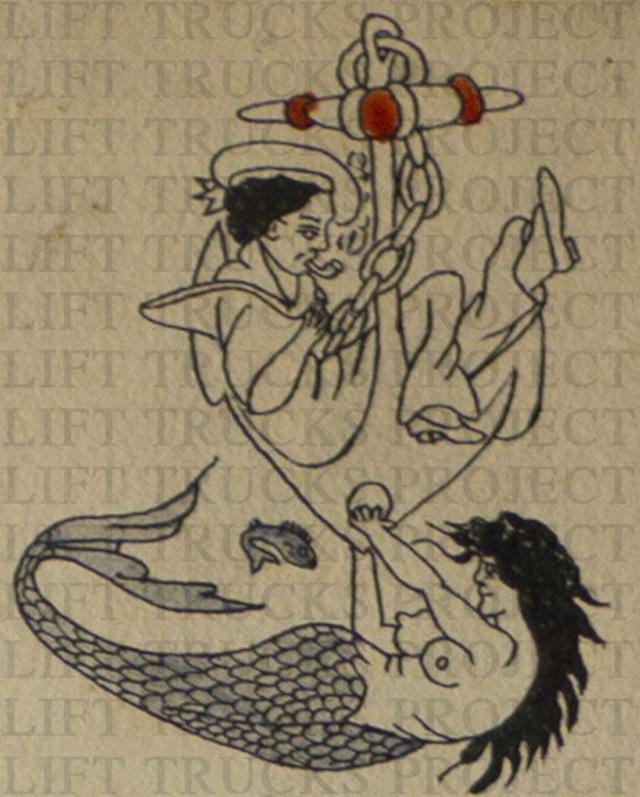 A dreamy sailor lured by a beautiful siren seems to symbolize Shanghaiing. On the other side of the coin so to speak, Diamond Lil could be downright sweet to the authorities liberally handing out these free ”piece” tokens. More tales from the Barbary Coast coming soon. References: The Barbary Coast by Herbert Asbury, Garden City Publishing Co, 1933.